These are just a few books that are of the "Fake Book" variety that you can use to either strum and sing as a group, or to have some players strum while others play the melody. 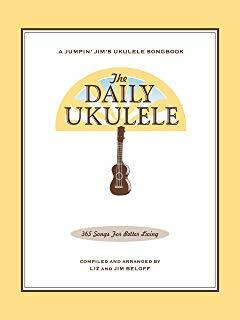 Of course, there's lots of other books out there, but the first two are ukulele "standards," and the others have some well-known songs for all ages. These can be found at most any music dealer, but as an Amazon Associate I earn from qualifying purchases, helping to keep the site up and running! These are available in a Baritone Ukulele version, too, but as long as your players play their version of each chord, it certainly can be played by guitar, mandolin, etc. These books are a bit of a "standard" for many Ukulele gatherings. These are nice for beginners, since the number of chords that they need to know is limited, and the songs tend to be of the more modern variety. There are guitar and ukulele versions of the books, but not necessarily the same songs in each.